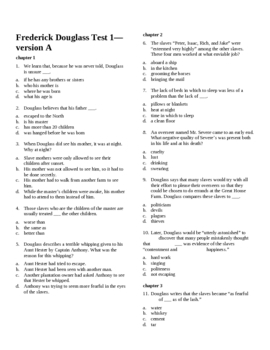 --Frederick Douglass Classwork, a total of 87 short-answer questions. There are two versions of the classwork--one for the Signet version of the text, one for other versions. --Frederick Douglass Tests, a total of 83 multiple-choice questions. --Multiple-choice quizzes on the 41-minute Frederick Douglass Biography video. --Answers for all classwork, tests, and quizzes. --Freedom and Slavery Essay handout.